Two members of an arms-smuggling racket have been arrested at Manipur’s Churachandpur district during a search operation, a police officer said on Monday. A report published in the The Times of India stated that the two accused, who were arrested on Saturday, confessed to have brought arms from Behiang Village at the India-Myanmar border to Churachandpur town via Singngat, the sub-divisional headquarters of the district, he said. 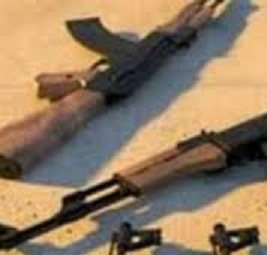 The report further stated that based on their statements, police raided a storage vault at Sumchinvum Village in Churachandpur and seized two rifles and several magazines, the officer said, adding that more details in the case would be available after further investigation. In an almost similar case, the Congress MLA from Manipur Yamthong Haokip was arrested recently by the National Investigation Agency (NIA) in a missing arms case, according to an official statement. The NIA is probing the case pertaining to theft of 56 pistols and 58 magazines from the Director General of Police pool armoury located within the premises of 2nd Manipur Rifles Battalion, Imphal. These weapons went missing between 2016 and early 2017.